We don't know if this counts as "blocking the box" or not. ResurGince? ReGinesis? Whatever hip term you wish to give it, Ginuwine’s “Pony” has made something of a comeback in recent years. First it was accompanying Channing Tatum’s hypnotic moves in Magic Mike and then Ginuwine himself performed it at the Unity concert in Parks And Recreation’s sixth season finale (awkwardly dedicated to the memory of Li’l Sebastian). Well now the song has found the one thing it needed to put it over the top: a Brooklyn twentysomething’s Vine account. Tony Only Dances To “Pony” finds the titular man gyrating around his apartment, his office, and New York City at large while Ginuwine’s “Pony“ plays in the background. 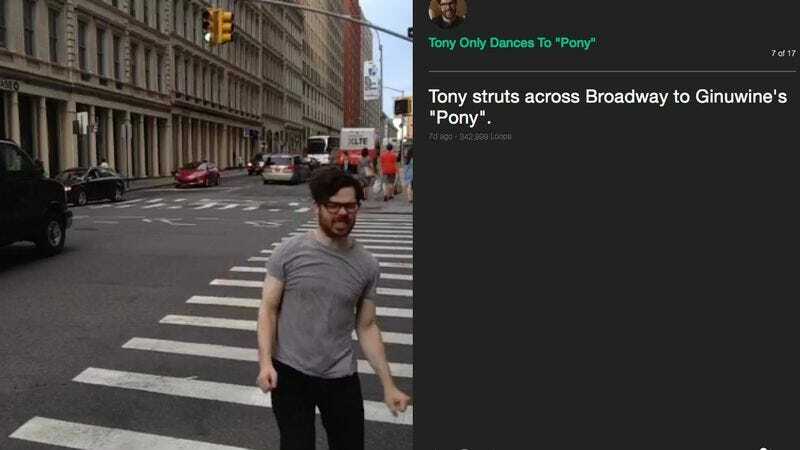 There’s a compilation video of many of his Vines below documenting all the various ways and locations that Tony enjoys getting down to “Pony.” It’s an impressive arsenal of dance moves that will no doubt lead to some form of a dance off with the newly-minted Gambit. Meanwhile, Montell Jordan is happy to remind everyone that “Let’s Ride” still exists and is ready for its own social media explosion.